Paralegals can learn a thing or two from those mean-spirited, long-necked, white critters that arrogantly stride across the roadway at a leisurely pace, honking and plodding, as they stare back at us with those beady eyes and sharp beaks, not at all bothered by our repeated honking and cursing at them…as though it will help to motivate their swift journey to the other side of the street. You know what annoying critters we’re talking about, right? Geese. Paralegals can definitely learn a lot from geese. Why, you ask? Consider this an informal education on both, geese and paralegals. 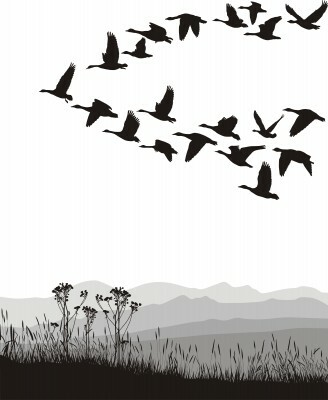 When geese fly together in a V formation, the flock’s flying range is 71% greater than that of any bird flying alone. When paralegals fly together, or share a common direction and sense of community, we can get where we are going more quickly and easily because we are traveling with the assistance of each other’s energy. We can fly together in person and/or virtually, thanks to the wonders of technology. When a goose falls out of formation, it suddenly feels the drag and resistance of trying to fly alone, and quickly gets back into formation, taking advantage of the lifting power of the birds in front. When paralegals let memberships slide and don’t interact with their peers in person or online, they experience the drag of feeling alone and out of touch. Paralegals should stay in formation with those who are headed where we want to go. We should be willing to accept each other’s help and insight, to help everyone fly high. The geese in formation honk to encourage those up front to keep up their speed. When the lead goose gets tired, it rotates back into formation, and another goose flies out the point position. When paralegals rotate and support each other in leadership roles and encourage others to move forward in their careers, we all become stronger and smarter through shared action and responsibilities. When a goose gets sick or wounded, two geese drop out of formation and follow it down to help and protect it. They stay with it until it is able to fly again or dies. Then they launch out on their own to find another formation or to catch up with the flock. Paralegals can help each other in similar fashion, when the going gets tough for a peer – and count on the same help when they need it. So, what’s the point? Lynne and I both want to be like geese, plain and simple. But instead of honking, we blog, encourage, network, share, and enjoy the company of fabulous paralegals from all across the country. We enjoy flying in a V formation with other legal staffers across the country, many of whom we’ve never met. We’ve never even met each other in person! Yet, we choose to fly together. Heck, we’ll lead or fly in back sometimes. We’ll keep you company in the middle of the pack as we chatter about legalese. We’ll even drop behind to look for “survivors” if the need arises, and we’re happy to do it. We want to give back, and to personally reach out, grow, and help others to do the same. We want to encourage positive changes in the profession, and make each paralegal’s flight a little easier, a little more enjoyable, a little more fun – so that the entire flock benefits. Too often, paralegals find themselves competing with other paralegals for jobs, opportunities, pay raises, better cases, more billable hours, the senior partner’s attention, a new job title, or a better professional reputation — competing and competing and competing. Unfortunately, this competitive, self-oriented mindset can often spill over into other aspects of our lives, both personally and professionally. So we choose not to be competitors, but instead, members of the same flock. We are two “paralegal geese” flying in the V formation because we make the conscious, deliberate, and absolutely crucial decision to do so. We don’t fly alone. We look for stragglers. We chat up the middle of the pack. We are never alone. Jamie Collins is the founder of the excellent collaborative blog, The Paralegal Society, http://theparalegalsociety.wordpress.com/. She also provides a lot of great information at her Practical Paralegalism profile. Jamie’s energy and passion for the paralegal profession inspire me – and make me glad to be a goose.